In the heart of the VhaVenda people, Khoroni Hotel Casino Convention Resort is a gem in the bush plains. Located in Thohoyandou and close to the Punda Maria Gate of the Kruger National Park, Khoroni Casino offers an excellent getaway. Operated by the Peermont Group, expect a stunning casino, luxurious hotel, and a memorable stay. 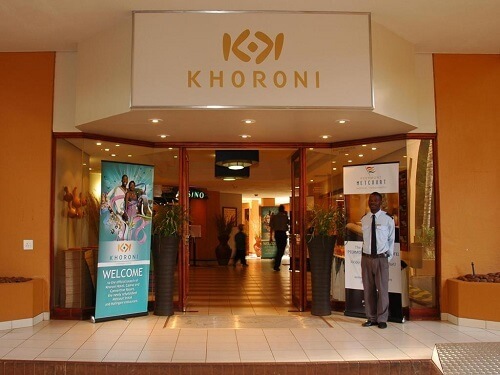 Boasting the most extravagant and spacious casino in Limpopo, the chances for winning at Khoroni Casino are huge. The casino has 150 modern slots and eight gaming tables for your entertainment. Denominations for slot machines range between 2c and R10. The betting range on the three blackjack tables is from R25 to R1 000, and R5 to R200 at the five American roulette tables. The games are divided between the non-smoking, smoking, and exclusive Prive area for the high rollers. Slots are open 24/7 while tables open at 10:00 and light meals are on offer on the casino floor. Finally, make sure to sign up for the Winners Circle loyalty programme to get access to the best discounts, rewards, and exclusive offers. For those looking to spend the night after an exciting evening of gaming at the casino. Or you’re looking for a stop over on the way to the Kruger National Park, you can’t go wrong with the Peermont Metcourt. The Khoroni Metcourt is a three-star hotel with 107 beautiful rooms and suites. The contemporary afro-chic décor rooms come with satellite TV, air-conditioning, and free WiFi. Furthermore, guests can enjoy their 18-hour room service. The great Malingani Restaurant will satisfy any cravings and tastes with their scrumptious offerings. They serve a full English breakfast, lunch, and lavish dinner buffet. They also have an a la carte menu. The entire family can enjoy what’s on offer at the chic Malingani. Khoroni also has its own Moo Bar. The cocktail bar is renowned for its awesome live entertainment which can be enjoyed from Thursdays to Sundays. Likewise, Moo Bar is also known for its big screens that broadcast the matches of the day. For guest looking to relax and unwind, there’s the CSpa Wellness by Camelot. It promises the ultimate in wellness and revitalisation with a range of spa treatments and therapies. Khoroni Casino has some great things on offer, ranging from excellent gambling services, fine dining, and feeling pampered. For more on casino in Limpopo, read our comprehensive guide.